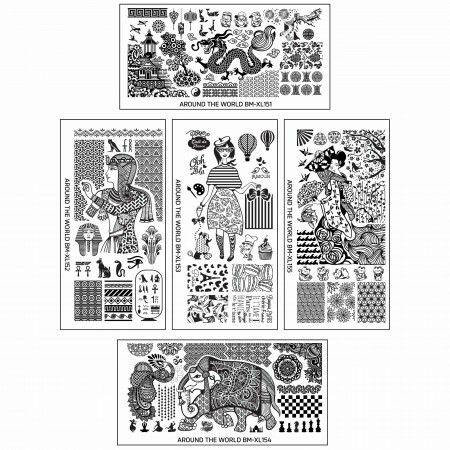 Lacquer Lockdown: Hot Off The Stamping Press: Bundle Monster Around The World & Time Machine Master Sets! 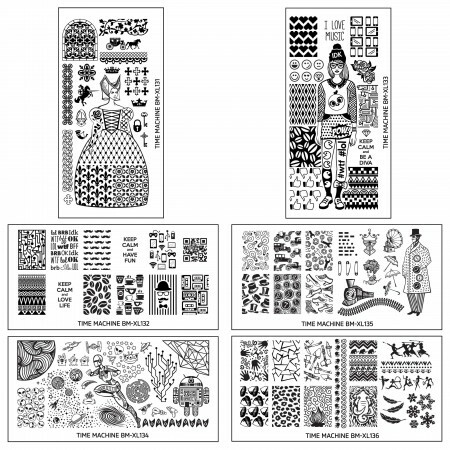 Hot Off The Stamping Press: Bundle Monster Around The World & Time Machine Master Sets! Continuing to my catch up bit by bit. Today I'm looking at the 2 new sets Bundle Monster released called Around the World and Time Machine Master sets. Each set consists of 5 plates which you can either purchase all together or individually. They have the feel of MoYou London styled thematic landscape plates without the complete cohesive execution of them. At a glance I felt the Around the World Collection was more successful at this undertaking than the Time Machine one, but let's take a closer look. Shanghai (China) - Novel meets played out. We've seen dragons and pagodas done to death and they continue to be done to death. MYL may have one the best collections on the market when it comes to these images - the Suki Collection. However what I like about what BM did here are the individual elements - the paper crane animals, the tiny monks, and the Great Wall of China. Even the pagoda image is one I haven't seen before though the larger patterns are way to familiar across many different brands of plates. Delhite (India) - An homage to paisley which several ladies, myself included, cannot get enough of! One of the best executed designs of this entire collection though if you know your plates, and you know I do, there are some repeated elements. The smaller bowing dancers and the chess pieces (which really make no sense to me) as well as one of the Mandala elements are a touch too reminiscent of images I have from the Nail Matinee plates. Still despite that this is my favorite plate in the entire collection. Egypt (Africa) - Had the potential to be an awesome plate, but from the embarrassing name, which I will not be repeating here, down to the repeated patterns from several other prominent plate makers this plate is a disappointment. I'm not sure why the pharaoh is wearings some kind of leopard skin but it doesn't work in the busy array of patterns and patches that make up his body. Eep! Paris (Europe) - cute cute cute. This plate isn't horribly unique, but it offers some truly cute and fresh approaches on a Parisian manicure. I love the little cheese skirt and the poodle is to die for. The lines and bows might be played out but in combination with the baguettes and the rest it becomes fresh again. Whimsical and well done BM! Kyoto (Japan) - welcome to Kyoto in the spring! As typical as I expected while offering some images that pander to the Japanese loving crowd. I love the Kimono even though they snuck a bunch of unnecessary and IMO slightly ugly roses into the bottom. The dragonflies are genius, the obi of dots sweet, and the fan of whales a touch of magic! Well played but what the hell is up with the Nyan cats and the MYL Mother Nature birds and trees? Close to cool but definitely not perfect. Of this collection despite my critical appraisal I'd buy it hands down. There is enough novelty across all of these plates except Egypt to make this a worthwhile investment especially if you don't have similar plates. I understand not everyone has a collection like mine so I do try to keep that in mind when I'm looking at new plates. Overall I'm pretty pleased with this set of 5. This Time Machine reads like an ode to the MYL Fairy Tale, Hipster ,and Sci-Fi Collection with a bit of the Time Traveller thrown in for good measure. Looking at these plates I was so disappointed because I definitely expected better from BM than this. The best and most unique plate here is XL136 The Prehistoria since it has the highest number of unique elements and a little cutie elephant face. I'm not really sure about the random shifted triangles or the acorns, but on a whole it is the only plate I'd actually bother to purchase. The rest feel so much like prior MYL plates with a mix of images I've seen from FUN and Marianne Nails that I'm disappointed down to my gills. Rather than pointing all of these dupes out I will just leave it at that. I think its one thing to emulate a successful style of plates but putting your own fresh twist on things is definitely necessary especially when the market is so oversaturated these days and consumers so well informed. Whew... and she's b-a-c-k! That interesting take mixed in with a little funny sarcasm that I've missed so much. Those roses are really ugly too hunh?! Lol thank you hun! Glad to see someone missed my banter lol. Honestly I wanted these plates to do more for me than they did I was llike hmmmmm what happened here. I do think the Around the World was infinitely more successful than the Time Traveler plates. However nothing here blew my socks off and yes those roses were not well done. Also in general I'm just sick to death of platemakers creating roses roses and more roses. My god of the millions of flowers that exist in the world why on earth they keep picking roses is beyond me! Bundle Monster has been dissapointing me since the Secret Garden collection. I've been expecting so much from them and left their page feeling nothing. I'm not going to say I don't like a couple of their new plates from every new collection, just that I'm not really interested in their full sets. There are other brands I could invest my money better (Uber Chic, I'm looking at you~~ lol) than BM. Lol very honest Lizzy! Well I did think the Around the World featured some nice images but yes I have to say the TIme Traveler left me cold. I thought the Secret Garden Collection was on a whole successful it just wasn't very different from all the other buffet style plates that were out there. Bundle Monster is sort of like Born Pretty in some ways - they try to appeal to the mass. So their designs are a little broader a little less risky and different and very main stream. Brands like UberChic and Messy Mansion speak to a niche its just their brands are so innovative that their designs speak loudly and when people see how beautifully their designs translate they also want to try them. It depends much on your needs as a stamper. I own all the BM round sets except the revamped 2010 one. I own only a smattering of the rectangular ones. Back in the day BM used to be one of the biggest innovators on the block but time has changed and companies like MYL have really taken the whole industry up a notch. Its good but people aren't going to go so gaga as they used to over BM in the past especially not with them aping the competition. I believe thats one reason they started making these XL rectangular plates. Its just when you've seen how good other companies have been its hard to look at these plates and not want more. I understand your frustration, but as always I hold a lot of hope for BM. They still make my favorite plate organizer ever! I not too long ago ordered the Around The World full set. I wasn't too keen on the Time Machine set. Being a new at stamper I don't mind them so much. I loved reading your post and looking forward to more of these to help with my future stamping plate purchases.